One of the more surprising features of Davis are the fruit trees that grow in every neighborhood—not just lemons and limes, but persimmons, olives and pomegranates. This last fruit is something I’ve always placed in the too-much-effort category. I find picking out the seeds to eat one by one, then having to spit each out after extracting the minuscule amount of juice from it, entirely too tedious. There is, however, one application for pomegranate that I can get behind: grenadine. 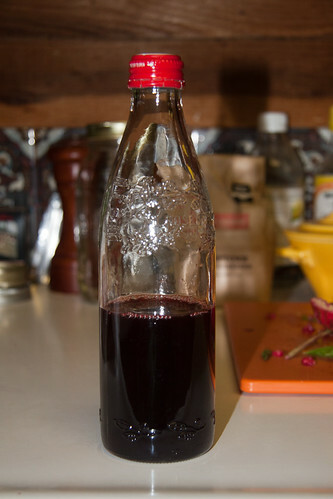 Homemade grenadine is a far cry from the overly sweet and artificial tasting store bought kind. It also ditches the neon pink color for a deep magenta that is quite pleasing to the eye. 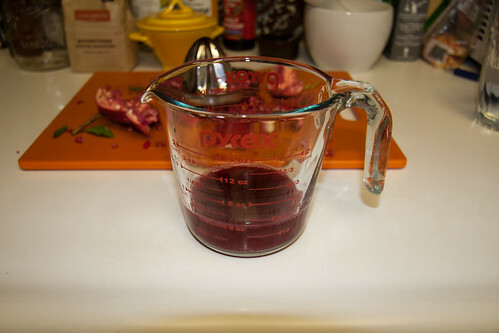 Fortunately, making grenadine from a fresh pomegranate is much easier than actually eating that pomegranate. I bought a few blemished pomegranates from Pearson Farms, a small fruit grower in Marysville, CA. I have a soft spot in my heart for Marysville, and its small downtown. My family often stopped there, on our way to or from camp, and I would take in their large pond with ducks and other water fowl, wishing I had a paddle boat to cruise around it. In addition to being a quarter of the price of the unblemished fruits, the blemished pomegranates have the advantage of being split precisely because they are very ripe. To make my grenadine, I followed Jeffrey Morganthaler’s recipe. 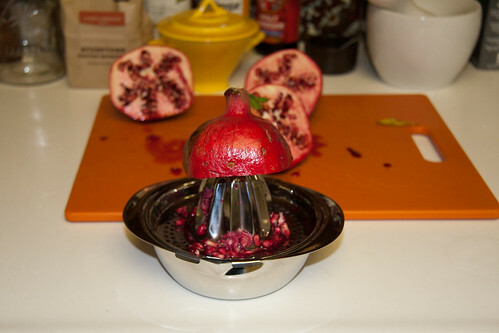 I sliced each pomegranate in half, then juiced them using an citrus juicer. 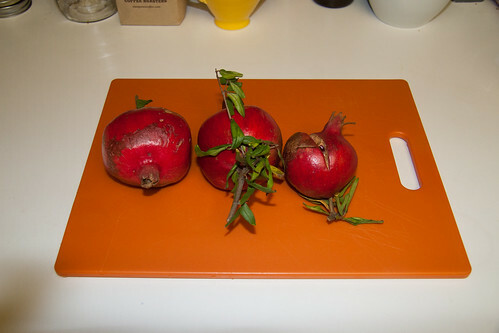 My technique is apparently not as effective as Morganthaler’s, because where he claims he gets about a cup from each pomegranate, I got half a cup from all three combined. That’s really okay, because I won’t be using that much grenadine, but something to note. 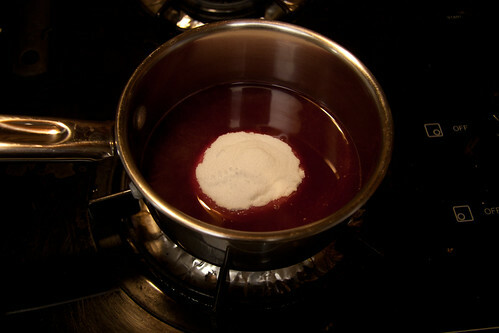 I heated the pomegranate juice on the stove until it was starting to steam, then added a half cup of sugar, stirring to dissolve it. 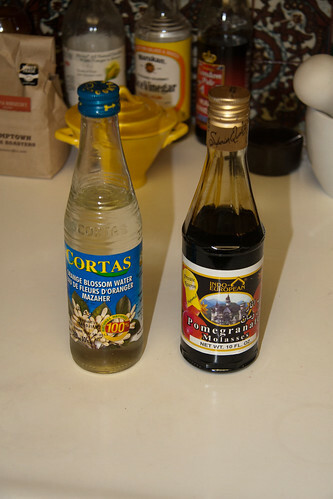 Finally, I added a half ounce of pomegranate molasses and the ever important orange blossom water. I poured my grenadine into an old Rose’s bottle and popped it in the fridge. It’s plenty to cover a few pink drinks this holiday season.